Should coconut oil be in your diet? To decide whether coconut oil is right for you, you need to know which nutrients your body needs. The best way to learn this is with a blood test. InsideTracker blood analysis measures key biomarkers in your blood and provides nutrition recommendations based on a database of over 7500 foods to help you choose foods that will help to optimize your well-being and performance. Read on to learn more about coconut oil and whether it has a place in your grocery cart, and click here to see a free InsideTracker demo. 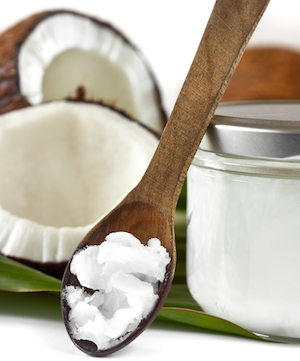 Coconut oil comes from pressing out the natural oil in coconut flesh. It’s very popular in southeast Asian cuisine and has a variety of culinary uses, including cooking and baking. Many people use it to make stir-fries and sautéed dishes, but it’s not ideal for frying because it has a lower smoke point than other oils, such as canola and peanut oil. Unlike its counterparts, coconut oil is solid below 76 F because it has a very high saturated fat content, which makes it resistant to spoilage and gives it a very long shelf life. In fact, coconut oil contains about 90% saturated fat, much more than butter (about 64%), beef fat (40%), peanut oil (17%), olive oil (15%) or canola oil (7%). Click here to learn how InsideTracker can help you incorporate coconut oil and healthy fats into your diet! The Dietary Guidelines for Americans recommend that saturated fats should make up less than 10% of total daily calories to reduce total blood cholesterol levels and low-density lipoprotein (LDL) “bad” cholesterol levels. High levels of LDL can result in a buildup of cholesterol in your arteries, and eventually, LDL cholesterol can enter your blood vessel walls and begin to build up under the a restricted blood flow. Although some research has questioned the link between saturated fat and poor heart health, studies have found that replacing saturated fats and trans fats with polyunsaturated and monounsaturated fats reduces the levels of LDL cholesterol and increases the levels of HDL cholesterol, improving heart health. The saturated fat in coconut oil and other plant-based oils is generally considered to be healthier than saturated fats from animal sources. In addition, recent studies have shown that coconut oil in its natural form boosts healthy HDL cholesterol. HDLs act as cholesterol scavengers, carrying cholesterol from other parts of your body back to your liver, which removes it from your body. The higher your levels of HDL, the healthier your heart is likely to be. However, the fat in extra virgin coconut oil is different from the fat in hydrogenated coconut oil. Hydrogenation creates trans fats, which are made by adding hydrogen to unsaturated fats. This process creates fats that are less likely to spoil than naturally occurring oils, thus extending the shelf life of the foods they’re used in. Research studies show that synthetic trans fat can increase unhealthy LDL cholesterol and lower HDL cholesterol, which increases a person’s risk for cardiovascular disease. Coconut oil received a bad reputation in the 1990s partially due to hydrogenated coconut oil, which has a high trans fat content. Virgin coconut oil is also different from other oils because it has a high medium chain triglyceride (MCT) content, whereas most oils consist entirely of long-chain triglycerides (LCT). Our bodies actually metabolize MCTs differently than LCTs, transporting MCTs directly from the intestines to the liver, where they’re more likely to be burned off as fuel and slightly raise the metabolic rate. In contrast, LCTs are more likely to circulate throughout the body and be deposited in fat tissue. So, the MCT content in coconut oil has two benefits for athletes: it can be metabolized quickly for energy and it may increase HDL cholesterol. Because it is quickly metabolized, coconut oil can provide a significant amount of energy from fat; fats contain 9 calories per gram, compared with 4 calories per gram in carbohydrates and protein. Fat’s calorie density, along with your body’s nearly unlimited storage capacity for fat, makes it your largest reserve of energy. One pound of stored fat provides approximately 3,600 calories of energy. While these calories are less accessible to athletes performing quick, intense efforts like sprinting or weight lifting, they become essential for lower intensity and endurance exercise such as long-distance cycling and running. In fact, your body actually stores some fat in the muscle fibers themselves. To sum it up, coconut oil has a terrific flavor, and there’s no harm in using it in small amounts. However, due to its high saturated fat content, it should be used sparingly. Most of the research that has been done on coconut oil thus far has consisted of short-term studies that have examined its impact on cholesterol levels, which means that we don’t really know how long-term consumption of coconut oil will affect heart health. Furthermore, coconut oil might not be as nutritious as other plant-based oils, such as olive oil, because these oils are high in monounsaturated and polyunsaturated fat, which means they lower LDL while increasing HDL cholesterol. So coconut oil can provide some of the calories you need to have from fat, but a little bit goes a very long way. To learn more about how to incorporate healthy fats into your diet, sign up for InsideTracker today. Click here to view the free InsideTracker demo.